The Seamless Frozen Ice Water Textures are now for sale on both SL Marketplace Shop and the InWorldz Marketplace (InBiz) or from our inworld main stores in Second Life and InWorldz. For more holiday and seasonal textures visit the blog HERE. Below you can read more about this texture set and see the advertisement poster. 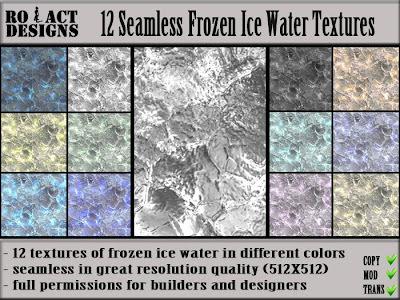 This set contains 12 seamless textures in great quality resolution (512 X 512) of frozen ice water in different colors.